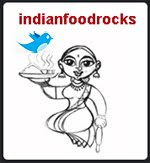 Indian Food Rocks: Merry Christmas and a Happy New Year! Merry Christmas and a very Happy New Year to you too! Merry Christmas to you too Manisha. You know I have never ever wished so many people at Christmas,but now a days due tp blogging I have so many international friends that I get into the Christmas spirit too. Manisha, I am sorry I could not share notes with you since I got too busy. I did bake the cake and it turned out fantastic. I omitted rum, but it is still too delicious and tastes the same as we get in Kerala during Christmas. I will include a picture in my next 'cooking from the blogs' post. All the best with the baking. Wow Manisha! I just saw your snow pictures! Thats a lot of snow. Lucky you guys are having a white christmas. So beautiful and I really enjoyed them all. And your tree looks awesome in the picture. where was I? I didn't even know about this snow storm :((. Hi .Im a new visitor to your blog.I just loved the pics here.Nice recipe too....will sure visit frequently hence forth.Merry xmas and happy new year to you. Manisha, loved the pics. We didn't have any snow and I am really disappointed. Looks like you guys had a great time. I made Archana's fruitcake and it was great.Hope it turns out well. Merry Christmas to you Manisha, enjoy the season with family and friends. I always wish for snow on Xmas day, but 2 feet oh oh ! Thank you for sharing these beautiful pictures. Sweetie the blue spruce looks like a tree in the heaven - honestly. 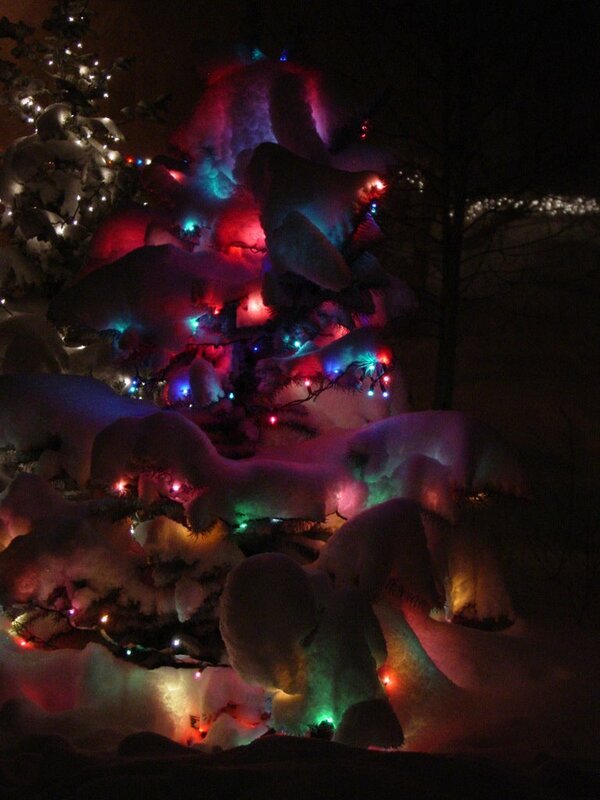 The snows just adds up to the beauty of the lights. Glad to know that you guys had fun sledding. Merry X-mas to you and yours. You lucky girl...all that free frosting...Well, we had a white Christmas too...it snowed in Gulmarg...we saw it on TV! Manisha, I'm a little late wishing the three of you a very Merry Christmas, but I'm right on time wishing you and your sister and her family a very merry celebration together. Our son and DIL just made a flight out of Denver before the airport closed and Max' mother had to change her plans to fly to Michigan from Wednesday to Christmas Eve, at least she got there for Christmas. But we all survived the snow, and it was beautiful as your snow covered spruce proves. Merry Christmas and Happy New Year. I am sure after all the problems u had with the dried fruits and the microwave, the cake turned out well. Do post pics when you have time. Have your sisters family reached safely, cos thers gonna be another snow storm for the next 2 days. Stay warm and try not to go out much and have fun. Priya, thank you and the same to you and yours. It's 50F today and we still have about a foot on the ground. We may get anywhere from 2 inches to 2 feet over the next two days! Come on over to Colorado where the snow is at! Dilipbhai, same to you and your family! I hope the fog is clearing across the pond there and letting some sun shine through. If not, I am sure you will make up for it with your delicious cooking! Nidhi, hope you had a great Christmas! Those chocolate covered strawberries you made make me want to drive out to Ohio now! Anu, food always brings people together. It's a warm fuzzy feeling, isn't it? The best part is that cooking can be very therapeutic and your family eats healthier and smarter! RP, no worries! I had one major disaster and then a minor one but the cake has been made. A small loaf pan was consumed before it had a chance to cool. We are now digging into the larger 9x9 cake. It got the seal of approval from my b-i-l, and he's a picky eater! Archana's cake rocks! My spruce has no snow on it. I really miss the way it looked! But who knows, maybe this next snow storm will shroud it with snow again! Shilpa, the fun makes it all worthwhile! Stay tuned, cos another storm is headed our way! Soumya, thank you and welcome! I hope to see you around more then! Gini, thanks and yes we had a grand time despite all the various things that went wrong! Archana's fruitcake is to die for! Archana, so how does one thank you for touching our lives in a very special way? Your cake made our family dinner extra special last night! Everyone loved - adored - begged for more of - the fruitcake, even the kids! Anita, never thought of it like that! Delicious cold frosting. You know, I don't let Medha eat any snow but a lot of the kids would eat snow when they fell face forward while sledding. And I even heard one Mom call out to her kid saying "Get up! There's better snow to eat up here!" and she went right ahead and ate some of the snow. I am pretty sure I had stepped on it just a few seconds before. Eating dirty snow can make you really sick! Now, catching snowflakes when they come down...I'm willing to allow that and do it, too! So much fun! I visited Gulmarg in the late 70s and have such wonderful memories! Yay! to a white Christmas! Gosh, Lee, if anyone is late, it's me! I'm glad everyone was able to get to their destinations safely. I still get gooseflesh when I think about the 9 year old who was travelling alone and went missing at DIA last week! I'll be in touch with you & C very soon! Love to you and Max! Deepz, the fruitcake was delicious. I would like to compare notes with you on changes to make for altitude. I increased the OJ by 1/4 cup and wondered if I should reduce the temperature and cook for longer. It could have been more moist but it's a crusty dense cake that comes alive when heated slightly. Some of us had it à la mode and that made it even more like heaven! My sis and family got here safely late last night and my b-i-l and the kids have headed for Vail to ski. Yes, they're ski nuts. My sister and I are getting a lot of quality time together and with Medha, we're doing some basic fun girly things together! You take care through this next storm and keep a shovel in the car, it helps! It helped me on my recent jaunt into Boulder! Wishing you a wonderful New Year Ahead !!! I read about the Denver snow Manisha and was thinking about you. Hope everybody is doing well and enjoying the beautiful winter. The picture is just gorgeous. Season's Greetings and have a wonderful new year. Wishing you and your family a very happy and prosperous New Year, Manisha!! 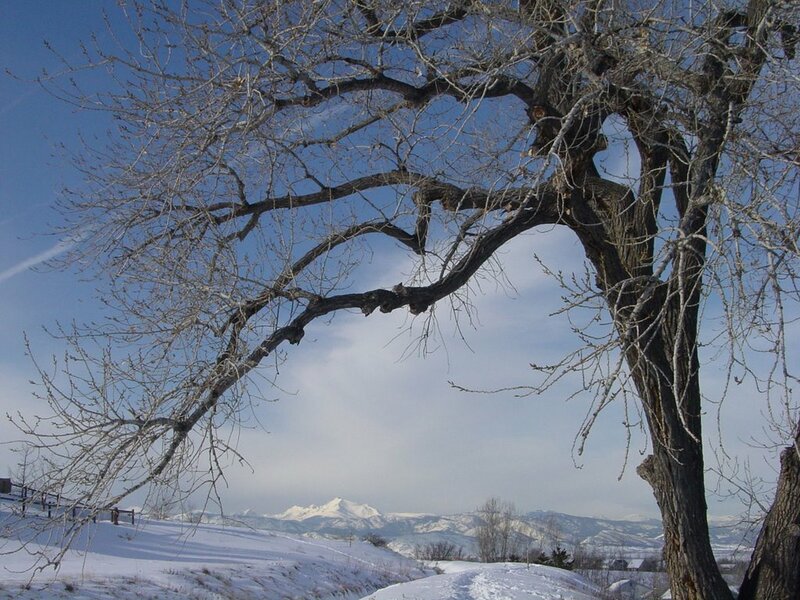 I just love that pic of the tree..awesome! Manisha dear, thanx a lot for the wonderful wishes and wish you too a fabulous year filled with the richest blessings...Have a rocking New Year Buddy! We added your RSS feeds to our website and are displaying your blog posts. We appreciate, if you can add us in your blog roll. Long time lurker-first time poster! Wish you a splendid joyful New Year ! So, Here's Wishing you a very Happy New Year Manisha. May God bless you and your family with all the happy things in this coming year. Wish you a very happy new year manisha!!!! I am blogrolling you now!!!!! Happy New Year to you and your family! Stay warm :) the pictures are spectacular...I can only imagine how the blizzard must have looked. Have A Blessed New Year to u n ur family. Hi Manisha I have tagged you for a meme check out my today's post. Hi Nidhi - this is my first time here. Lovely blog and gorgeous photograph. A very Happy New Year to you as well. Revathi, thank you and hope you have a wonderful 2007, too! Mandira, third storm in three weeks is on its way! I am not looking forward to spending my Friday evening shovelling the driveway! Pooja, it's sparkling alright! The snow melts during the day and turns into slippery ice that sparkles and glistens in the sun! I just drooled over your sev tameta nu shaak - it's been ages since I had it! Sailu, my blue spruce looked awesome! Who knows, it might look like that again by Friday night! Happy New Year to you and your family! Shynee! !, it's so good to hear from you! You take care and get back to enjoying what you cook! Cooking is a great form of therapy - don't let it stress you out! enewss team, thank you and welcome! Sunshine, welcome to IFR and I am really glad you de-lurked! I must say I shared your thoughts on the deportation story. I felt really bad for the kids, too, but how do you remember to take your GC and forget your kids' documents?! Priya, thank you very much! Happy New Year to you, too! I am looking forward to all the warmth you share through your blog! Archana, thanks! Stay warm and safe through all these storms hitting the Pacific North-west! Nidhi, you're a sweetheart! Thank you very much and I wish you the very same and much more! Dilipbhai and Anjali, thank you both for tagging me! I will check but it might be a while before I can get to it! Coffee, welcome! Yes, I contribute to Flower Fest. I'm glad we found each other all over again! Nupur, welcome! It's great to have you here! We're looking at yet another storm tomorrow - third one in three weeks! Mallika and Bhargavi, thank you and welcome to IFR! Purnima, I wish you and your family the same! Merry Christmas and a Joyous New Year to you and your family!